Transcription originally printed in Mississippi Cemetery and Bible Records, Vol. 17, 1978, pgs. 74-77, Mississippi Genealogical Sociery, original owned by Mrs. J. P. Wilkerson. Words given in parentheses are commentary added by Mrs. Wilkerson or her mother, Mrs. J. N. Harrold. Corrections at bottom of entry. L. Ella Weddle, born April 5 1890, Waterloo, KY, died Jan 30 1959, married Oct 30 1917 to W. N. Sievers, M. D.
Ida Judson Harrold, born Sept 9 1918, West Point, MS, married Jan 26 1941 Jeff P. Wilkerson, Jr.
Ida Judson Harrold, born Sept 9 1918, West Point, MS, married Dec 26 1941 to Jefferson Pinkney Wilkerson, Jr.
1These two names are incorrect. Margaret Weddle married Jerome Terrell Tarter, Emily Weddle married James T. Eastham. *The autobiography of Annie Presnall Wood, Caleb's sister, gives his middle name as Wesley rather than Westard. This family record comes from two different original sources, both in the possession of Charles Turpin. The first is the bank deposit book of James F. Trimble. The second is the day book of the same individual. 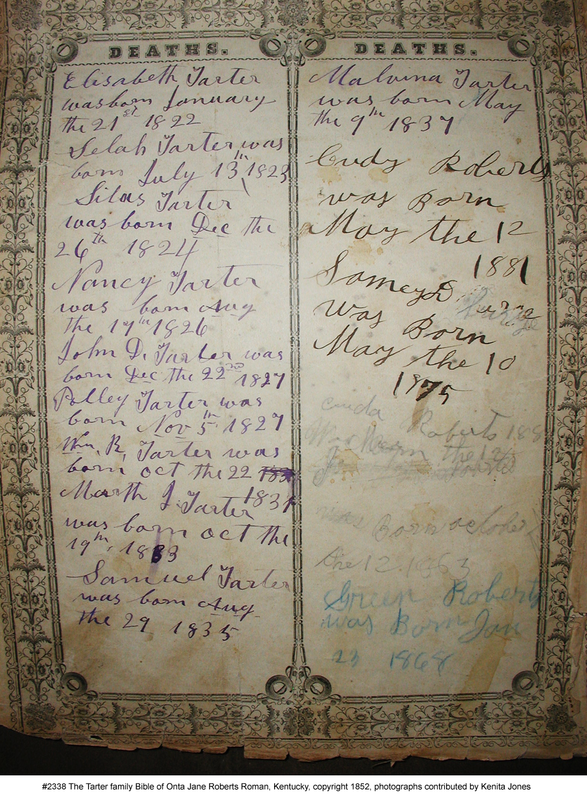 According to Charles, the handwriting does not appear to be that of James F. Trimble, and there is no indication who recorded this information. Nancy Trimble Died March the 13 18..
3. Children of James F. & Nettie Chris Trimble. Fails to list the couple's last child, Charles Grant Trimble, born 17 July 1879. Children given as only initials are Cyrenius W., Woodworth and Aggie Nora. Mary Ann Virginia Freeman, b. 2/23/1863, 7:30 a.m., d. 9/22/1916, at 6:00 p.m.
Etta (Humberson), b. Madison Co., TX, (b) 5/24/1889, at 5:04 p.m. d. 5/24/1889 at 5:06 p.m.
Anna Evalena (Humberson), b. Madison Co., TX, (b) 6/2/1890, at 4:00 a.m.
Mary Lilla Louvenia (Humberson), b. Madison Co., TX, (b) 2/17/1892, at 11:00 a.m. d. 4/14/1921, at 2:05 p.m.
Ethie Green (Humberson), b. Madison Co., TX, b. 7/28/1897, at 10:00 p.m.
Marion Allen Monroe (Humberson), b. Madison Co., TX, (b) 3/10/1901 at 10:00 p.m.
1 Date of death is incorrect. Francis Marion Humberson died in 1927. Photographs provided by Kenita Jones, who presently owns this Bible. 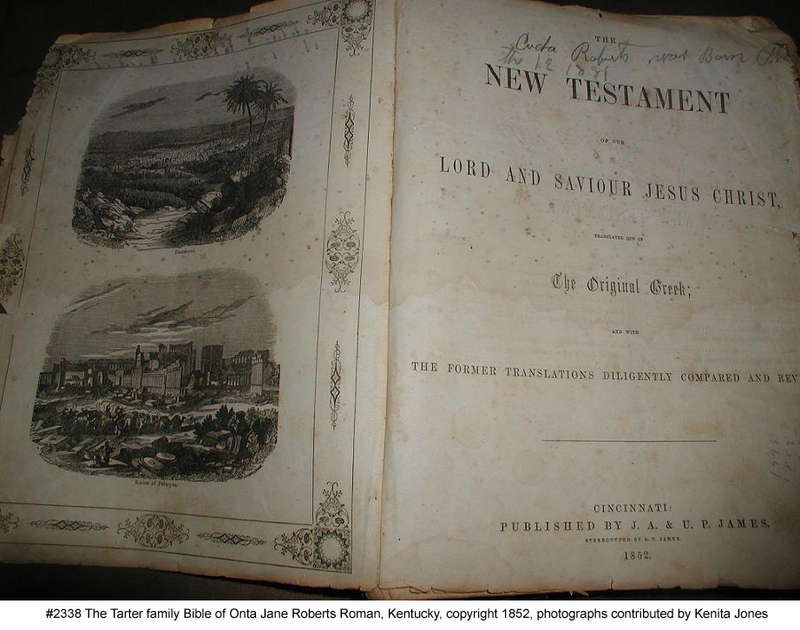 Ownership of the Bible passed from Martha Jane Roberts to her son Cuda Riley Roberts to his daughter Onta Jane Roberts Roman to her granddaughter, Kenita Jones. Based on the printing date of the Bible, there may have been one earlier owner, Elizabeth Tarter Roberts. There are two sets of handwriting styles recording these entries - one in old fashioned steel-nibbed ink pen and one in pencil. The first group, Elizabeth through Malvina, are the children of Jesse Tarter and Sally Weddle, of Pulaski Co., KY. The children born after Malvina (at least six) are not recorded. The remaining names are later descendants of this line. 1 John D. Tarter’s date of birth matches his tombstone so presumably is correct. Polley therefore cannot have been born in November 1827, if her brother was born in December 1827. Census data places Polley around 1836. Jincy Eliza Hammonds was born June the 28th (Wednesday) 1893 at 12 o’clock M 2¼ mi S.W. of Malden Missouri. Her mother’s name was Ida Sofrona Hammonds. John Caswell Hammonds, son of G. T. and Ida S. Hammonds, was born Sept 10th A.D. 1894, 2½ miles S.W. of Malden, MO. Mary Hettie Hammonds born Jan 2nd 1898 at 2 o’clock (or on the night of Jan the 1st which she prefers) being Saturday if born on the 1st of January or Sunday if born on the 2nd. G. T. Hammonds. She died March 1st, 1906 at Calexieo Calif and buried in a lot of the town. Have often wished the Lord would enable me to move her. G. T. Hammonds, 3, 5, 1916. George T. Hammonds to Mary E. Holden, Feb 21st 1886, by Rev. R. S. Hearsey, at bride’s house, Liberty Town, Stoddard Co, Mo. Josiah Melancthon Hammonds, son of George T Hammonds, Sept 7th, 1877 at Clayton, Vernon Co, Mo. Written in my own hand this Feb 28/86. George T Hammonds. Raised 5 children (all born in same co of Ky) to majority – 3 sons and 2 daughters. One infant son of 56 A.D. died in infancy (of cutaneous scrofula receding). Ida Sophrona Wynne was born August 24th 1865 in Pope County (near Columbus) Illinois. She is the mother of Jincy Eliza, John C. and Mary Hettie Hammonds. All 3 born 2½ mi. SW of Malden, Dunklin Co, Mo (in the first half of the 90s). Jincy and John still live here. Jincy is married to Benton E. Hall since Oct 1910. They have 3 smart children to their joy and grief. Sometime in early 1920 I expect their fortunes to change for the better for them, if not a little sooner. – G. T. H.
John is still single by the grace of God, but by grace of the mountains may double.